Home Science for Kids 5 Ws & H What were the Voyager Missions? What were the Voyager Missions? Imagine a journey that takes you a billion kilometres away from earth, to the edge of the solar system, from where you can look back over your shoulder and see our sun as just another star in the sky. We are not talking about a science fiction movie but the Voyager space mission. On August 20, 1977, the Voyager 2 spacecraft was launched. Close on its heels, the Voyager 1 was launched on September 5, 1977. Both the unmanned spacecraft were launched from the Cape Canaveral Air Force Station in Florida, USA. They were sent to meet Jupiter and other planets that lay beyond it in the solar system. What were the Voyager Missions? 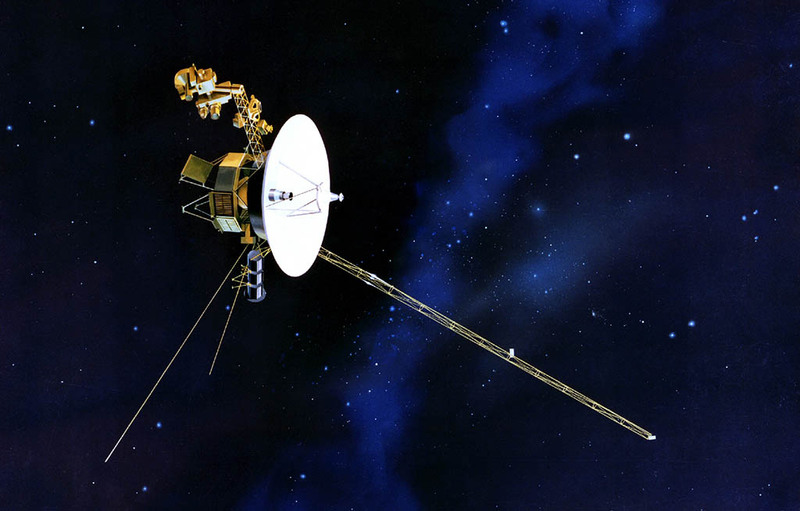 Voyager-2 Spacecraft. Voyager 1 reached Jupiter on March 5, 1979, after covering a distance of 650 million kilometres (450 million miles) through space. Voyager 2 followed a couple of months later because it had taken a longer path. They circled the giant planet and a few of its moons. They also took close-up photographs of the mammoth planet. These photographs show a giant storm, three times the size of Earth, raging on Jupiter. This area stands out on any picture of the planet as a dark red sore and it is rightly called the ‘Great red spot’. The Voyagers discovered and sent back photographs of an active volcano on Io, one of Jupiter’s moons. From Jupiter, the Voyagers continued their journey to Saturn and Uranus. They discovered several thousand ‘ringlets’ around Saturn apart from the rings man already knew about. They also closely inspected Titan, one of the moons of Saturn. What is interesting about Titan is that its atmosphere looked like what the earth must have been before life evolved on it. Does this mean that Titan will support life on it one day? One does not know. The Voyagers discovered 10 new moons of Uranus and six new moons of Neptune. Uranus was earlier known to have five moons, while Neptune had only two. Although the Voyagers’ mission was to unravel the secrets of the outer solar planets, the spacecraft are still sending back data about the outer reaches of the solar system. After this, they will continue their journey beyond the solar system. Imagine, as you read this article, the voyagers are still floating through space, billions of kilometres away. Will humans be able to travel on such a craft someday? Previous articleThis Bird Paradise Stinks!